40k is a huge universe and there's a lot to play except the main wargame even while still sitting at the table. So let's have a look at a somewhat less known tabletop game made by Fantasy Flight Games, the company mostly known to 40k fans as creators of 40k Roleplay. Here it is - Space Hulk - Death Angel. 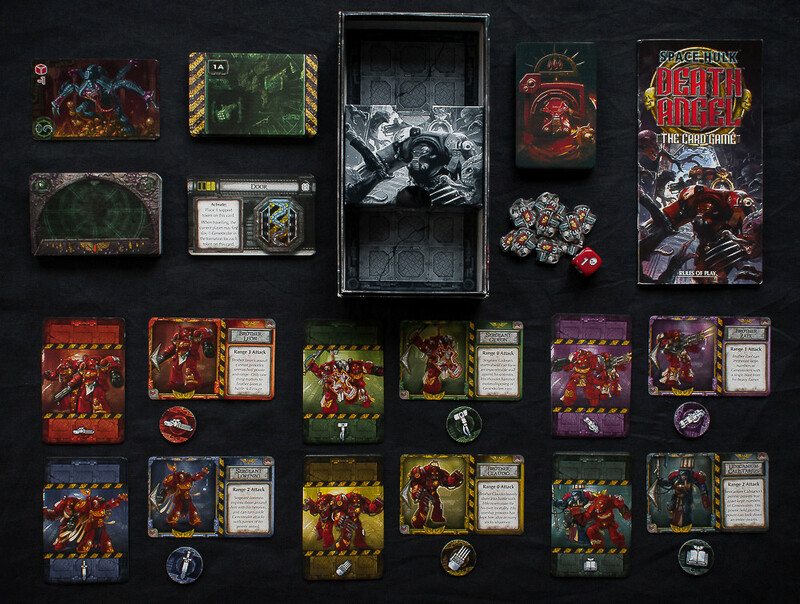 Death Angel is a card game adaptation of a widely known boxed 40k game - Space Hulk. I've actually held it in my hands once, but never managed to play it, so I won't make any references to the original. And first of all I'd like to note the quality of the game's contents. All cards are printed in full colour, with a nice texture to them, so they feel good to hold in hands and play with. There's a lot of pretty pictures too - every last card has an art on it. A lot of it is obviously from old 40k material but many were drawn especially for Death Angel. First look is a very satisfying indeed. As is the case with most tabletop games, game mechanic takes time to get accustomed to, but won't be a problem after a couple of games. Layout looks kinda like this: At the centre there's a column of your warriors, which are placed in certain location. Location's card is above the column and in it there are also several objects placed next to some of the terminators, These objects sometimes have special properties but are usually just serve as spawning points for genestealers. To pass to the next location players need to kill all genestealers that spawn every turn from stacks on the left and right of the location card. The game's objective is to finish four of them and then complete the special mission in the fifth, final one. Each turn starts with drawing and resolving an event card. Then to each team of two Terminators the controlling player gives one of three orders - move&activate, attack or to place a support token that gives the ability to reroll combat dice on any warrior. In addition to order effect each team has a unique properties of the way its order is executed which should be kept in mind as well. Finally the turn ends with genestealer attack phase, in which they make their best to kill the remaining Space Marines. I can't help noting how well the game represents the claustrophobic fighting in the depths of Space Hulk. Terminators are very slow to move (even simple rotation takes a whole turn) and no actions can be repeated, which forces you to think ahead. Battle brothers must support each other in order to survive and their tactical cooperation is often a key to success. Genestealers are always out to get you, occasionally appearing from behind, surrounding your warriors and putting them in a vulnerable position. And while well placed and supported Terminator can kill aliens in bunch, even one outflanking genestealer has a good chance to kill him and leave your forces vulnerable. The games relies on dice a good deal and some players may view this as a disadvantage. I, however, like the games with a degree of chance and the epic moments it occasionally leads to. We won't forget the triumphant return of brother Lorenzo any time soon. Up to 6 players can play at the same time, but the game is pretty flexible - you can even play it on your own if you like, although it's not that well suited for this style IMO. It's hard to remember all special abilities of all the warriors under your command which is a key to victory more often than not. Besides, the board games obviously exist to have fun in huge groups. BTW here lies one of the games's disadvantages. While moving from location to location, your squad will inevitably lose warriors. And if there are more than three players playing there's a huge chance of one of them eventually losing both of his terminators and immediately being kicked out of the game. There's no longer any place for him there and sitting in the corned while others are left playing is no fun for anybody. 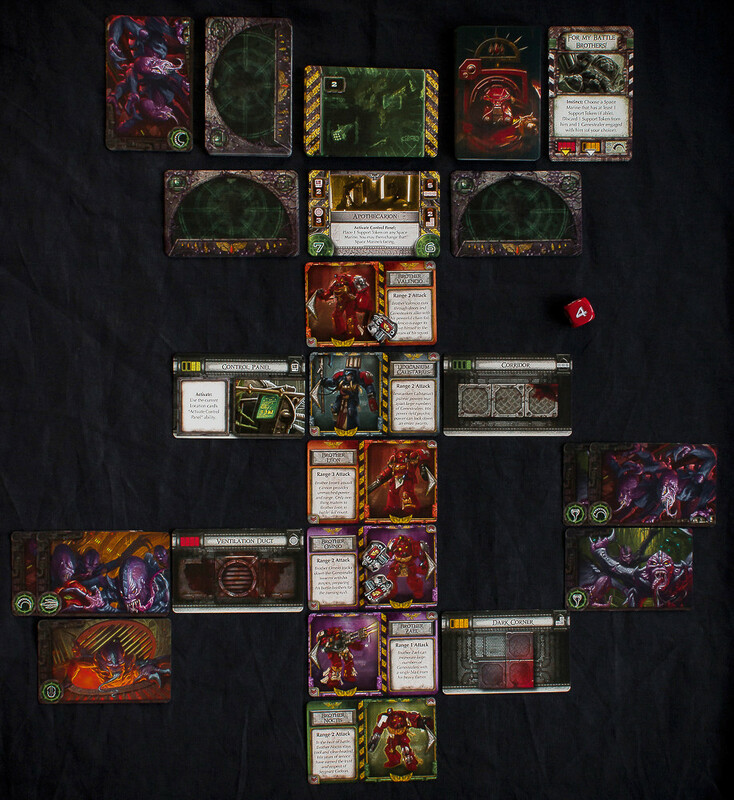 But this problem is pretty minor and, overall, Space Hulk: Death Angel is challenging, atmospheric and fun. And, despite minor drawbacks, I liked the game a great deal and it has the deserved place on my shelf. 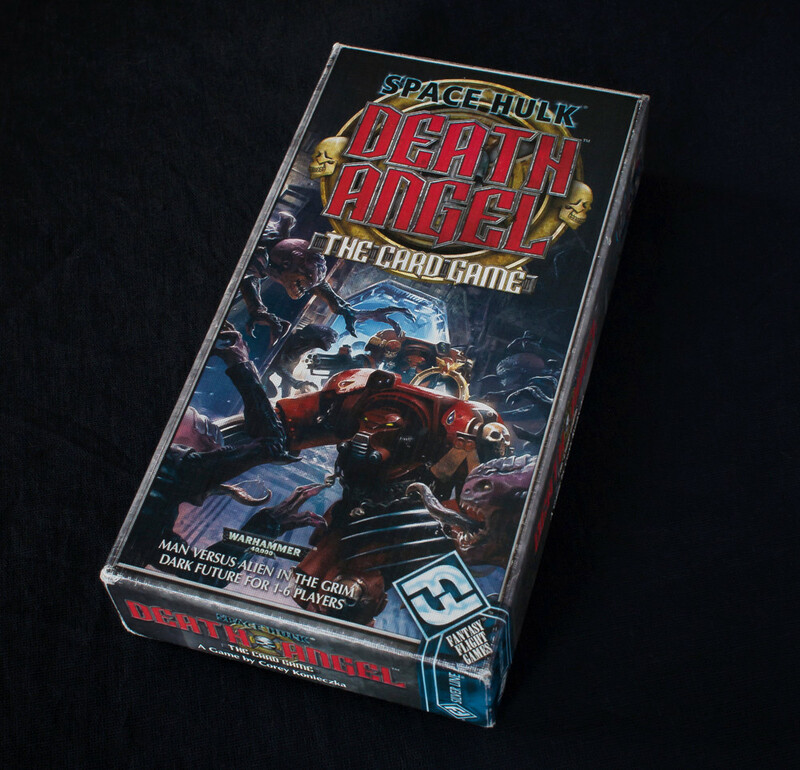 By now there are four expansions for Death Angel made by FFG. I'm not acquainted with them, but the possibility to expand the game once it eventually gets repetitive is obviously nice to have.